The market square is a riot of colours, smells and sounds. Not far off a woman is slowly wheeling a hand cart, piled high with orange fruits the size of cannon balls. You step passt a jewellery stall, the glass beads flashing with different coloured fire in the sunlight. Next to that, a man is frying mysterious objects in batter, the oil spitting high against the sides of the metal barrel he’s using as a brazier. You duck behind a cloth stall that looks more like a tent, swaths of amber, saffron and cobalt fabric fluttering in the soupy breeze. With a sense of relief, you spot the side street you were told to find and angle your way through the crowd to reach it. As soon as you exit the square, the temperature and tumult drops abruptly and you find yourself in a mercifully cool and hushed thoroughfare between buildings. You hurry along it towards a wooden sign that sticks out into the street. As you get closer, you note the spray of bay leaves in its centre and nod to yourself. Stepping up to the door, you prepare to knock but then spy the note: ‘Popped out, please wait within’. The herbalist’s shop is incredibly dim. You quickly realise this is because most of the windows have been obscured by living plants, all twisting themselves into odd shapes to try to make the most of the scant daylight. It smells richly of green things and also spices which make your nose tingle. A single candle is on the counter ahead of you, shining brightly on a piece of paper. The herbalist has left a shopping list he wishes you to complete but in order to do so, you’ll have to work out his incredibly bad handwriting so you know exactly what you’re buying. 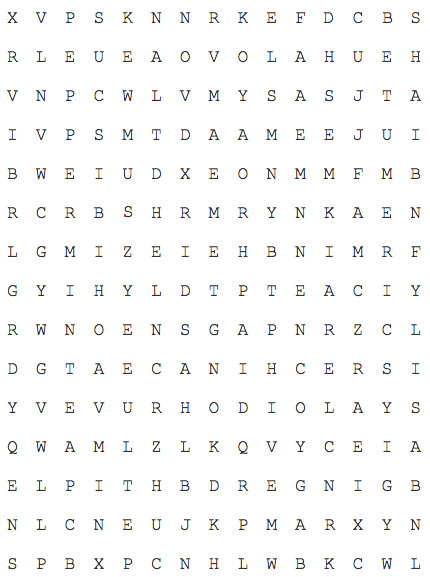 Fifteen herbs and spices (all of 5 letters or more) have been hidden in this word search. Please submit your answers as a written list and NOT as an image. You’ve just returned with an arm full of shopping when the door opens, a little bell tinkling. Rather than the herbalist though, it’s a customer. And they’re very agitated. They’ve developed a bizarre condition and they urgently need help. There’s no time to wait for the herbalist to return. You’ll have to look through the weighty book on herb law to see if you can find anything that will help them. Come up with a page from the Herbalist’s book that includes a description of the patient’s symptoms and a possible cure (I'd prefer you to create your own illness and cure, though you can of course take inspiration from ones we're already familiar with). You can do this through writing a description of the page and or how you encountered it (in which case please make it at least 100 words long) or as a graphic of the page itself (in which case please upload the image to an image hosting site and provide me with the URL).